Postcards From The Smokies » If It’s Not a Tube, Is It Still ‘Tubing’? If It’s Not a Tube, Is It Still ‘Tubing’? 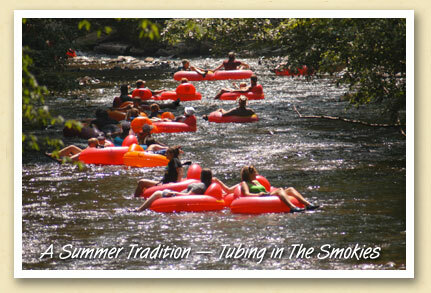 For generations of Smokies vacationers, ‘tubing’ has meant floating down the river on heavy black truck tubes, with protective disc seats lashed to the center (and making sure the long valve is on the underside of the tube). Traditionalists call this ‘real’ tubing. They argue that today’s light-weight plastic floats, while round, are not really tubes. “If it’s not a tube, how can you call it tubing?”, they say. It’s a searing controversy that’s totally ignored by the throngs that simply enjoy floating down the Tuck, the Oconaluftee and Deep Creek on a Summer afternoon. Tubing is a cool, relaxing and inexpensive activity for the whole family. Want to join in? You’ll find a list of tubing outfitters here.